I love this time of year – warm sunny days, beautiful beaches, icy-cold cocktails and the afternoon sea breezes (when you’re lucky). It’s also my favourite fashion season. There’s something about white dresses, denim shorts, a straw hat and a bikini that make me happy, and they never seem to go out of style. But black is timeless and I love that it works for summer too. This look is all about black and neutral tones and is something a little different, it is a simple look that will take you from the beach to a cafe with no fuss. I’ve put together a day and night look to help guide you through the summer season. 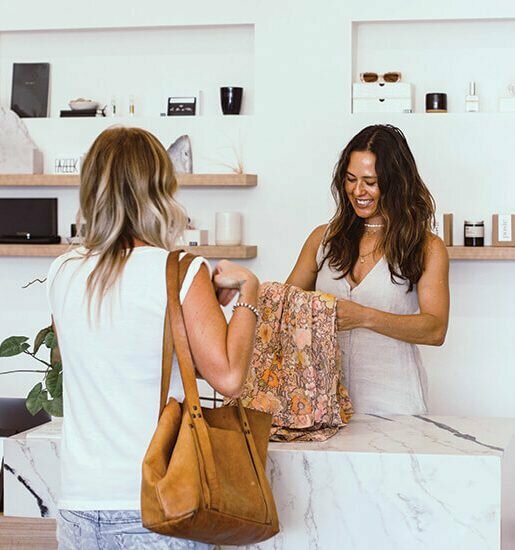 I’ve seen so many amazing pieces popping up in local Sunshine Coast stores – be sure to head to Summer & Salt at Peregian, Alterior Motif (Mooloolaba and Noosa) and Number Nineteen (Mooloolaba) to find something you love. This summer night look is all about keeping it simple. Mono-tones work well for every season. Black and white are classic and always in style. A simple pair of tailored shorts and sweet off-the-shoulder top are perfect for a night out at one of the Coast’s great restaurants on Ocean Street, Maroochydore or Hasting Street, Noosa. A simple beaded clutch and statement heels adds a touch of glamour to this simple look. Enjoy this beautiful summer weather. I’d love to see what you’re up to and what style you’re loving for summer on Instagram or Facebook – just use the hashtag #profilestyle or tag @profilemagazine.